Kamado grill cooking is for serious grillers who want to create culinary masterpieces using perfect heat control. Sweet and tender meat that falls right off the bone. If you are ready to join the kamado movement, you’ll need one of these best kamado grills of 2019. 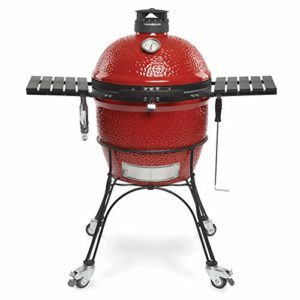 There are different types and styles of kamado grills. Having the right kamado grill for you is important if you want to both love your purchase and love your grilling experience. Let’s take a quick look at the options and what you need to consider, after you’ll see my top picks for the year. I’m sure by the time you’re done reading you’ll see a kamado grill that you love. Know all about Kamados already? Skip directly to reviews. 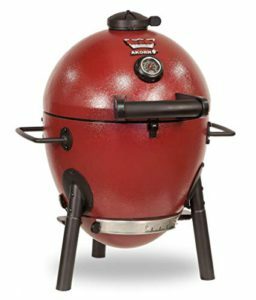 Kamado grills are pretty unique looking, with their large, egg-shaped bodies. But are they all as similar as they look? The answer is a complicated yes and no. In general they all work the same – like an oven, a grill, and a smoker all in one. They all create a heat-trapped environment that enables the creation some of the best food you’ll ever eat, but in specific, no, not all kamado grills are created equal. 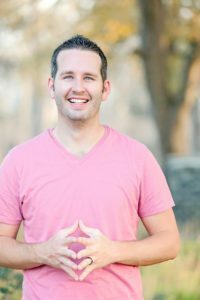 What are the differences, and are those differences important? Let’s dig into kamado grills a bit to find out before getting to the reviews. What Are Kamado Grills Made Of? 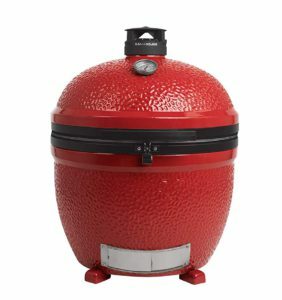 The majority of Kamado grills have a body (the egg shape) made of thick, high quality ceramic. It’s what most kamado lovers consider to be your best choice. Ceramic as a material is fantastic choice as it is an excellent heat insulator; it’s very efficient at holding both high and low temperatures. There ARE other types of kamado grills that have given the ceramic kamados some competition lately. Broil-King and Char-Griller have developed some very well-received models from steel, and Blaze has made an aluminium shelled kamado (see reviews below). Both types having good reviews and people really like the fact that they are not so breakable, weigh less, and thus are way more portable! How Do Kamado Grills Work? If you picture a typical Kamado grill, the dome shaped lid sits at about the 1/3rd mark, and is on a hinge. The lower 2/3rds is where the charcoal burns beneath the grill grates (atop a small firebox, usually). When the dome lid is closed (good Kamados have very tight seals or are built tong and groove), the unique “egg shape” allows the heat to be reflected evenly around the inside of the cooker. 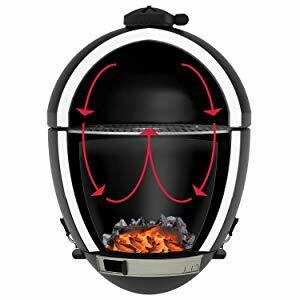 With the majority of kamado grills, air flows into a vent at the bottom to feed the fire, and ashes drop down into the base of the egg, or into an ash catcher. There’s also a vent at the top of most grills and together the vents allow temperature regulation (the higher quality grill, the more precise). Smaller grilling space is something that you’ll have to get used to with a kamado, if you’re new to it. Gas grills often have tons of space – kamados, not so much, and what you get is round (with one oval exception). There is a fairly wide range of sizes available if you look around (from the “perfect for 2-3″ 10” diameter to “feed the neighbourhood” 24″ diameter circles). Of course, the more space you require for cooking, the bigger the dome will need to be (and bigger = more expensive, heavier, etc.). Several kamados reviewed below have a primary and a secondary cooking surface so you can double your cooking space, or a way to create dual cooking zones with one grate. Because of the way the heat circulates inside, you can actually cook on the secondary surfaces and not just warm things… it’ll just be at a slightly lower temperature than on the primary grate, which is closer to the fire. Work space around the grill is another aspect to consider. When you’re grilling, you do need to have somewhere to put utensils, sauces and seasonings, plates, and other grilling necessities. 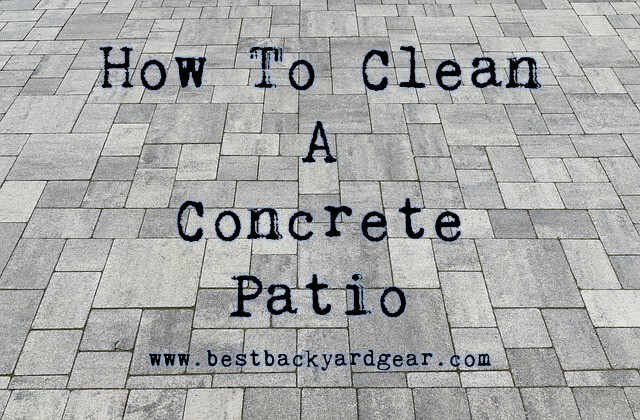 While some people have a great set up on their deck or patio already, it’s worth it to consider getting a model with sides or a table to go with/beside it. Grilling enthusiasts absolutely love the kamado grill – in fact, most say they won’t go back to gas or even pellet grilling after learning to use a kamado cooker. You can control heat levels extremely well, for one… which makes it perfect for low and slow. But you can also raise the temperature way up high by opening up the vents, which is perfect for quick sears. Kamado grills are incredibly versatile, great for grilling, smoking, barbecuing, and even baking! Want to read more? 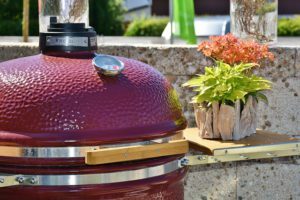 Following the reviews on this post, you’ll find Maintaining Your Kamado Grill, History of Kamado Grills, and The Rotisserie Question. Here’s a product overview of the 11 Top Kamado Grills we’ll be looking at here. The Kamado Joe Classic II is pretty much THE grill you need to consider whether you are a kamado grilling novice or an expert. No matter who you’re talking to, Kamado Joe is considered one of the best makers of kamado grills, and the Classic II is their most popular model right now. It comes with everything you need to start grilling (minus the charcoal and the meat), so you don’t have to buy add-ons. You get a built-in thermometer, a heavy duty rolling cast-iron cart with folding side shelves and a handle, a sturdy grate gripper tool and an ash tool, and more! It has Kamado Joe’s patented and super handy “feather touch” air lift hinge that makes the dome lid much lighter to lift. Remember, with Kamado grilling you want to lift that lid slowly in order to not add too much oxygen at once to the fire and to limit heat and smoke loss; the air lift hinge lets you lift that extremely heavy lid with just a finger, and stop it exactly where and when you want. The Classic II has Kamado Joe’s “divide and conquer flexible cooking system” that basically doubles your cooking space and gives you lots of options for cooking more than one type of food at once, on different surfaces, and at different temperatures (you can move half of the grate closer to or farther from the coals as desired). The seal that keeps the heat and smoke inside is reported to be excellent, as is the stainless steel lid latch. It also has a top quality wire mesh fiberglass gasket that supposedly lasts 10x more than the standard fitting that comes with most grills (meaning you won’t have to replace it NEARLY as often as with other grills). There’s a whole lot to love about the Classic II. It’s a serious grill that isn’t cheap, but a quality-built kamado grill is NOT cheap; if you’re careful with it, it will be an investment that you’ll be passing on to the next generation. If you need more convincing, check out the raving reviews on Amazon (click through). 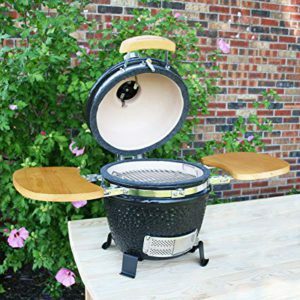 The BGE, as it is commonly known, is the high end ceramic kamado grill that sort of started the kamado cooking sensation here in North America. If you’ve heard anything about kamado grills, you will at least have heard of The Big Green Egg – it has quite the fan club, and for good reason! It has been around for decades and is absolutely both a great grill (high heat) and a great smoker (low and slow). Beyond that, it is made of quality materials, has fantastic reviews on its workmanship, and comes in a large variety of sizes (from 2XL to Mini) and a huge batch of accessories. The BGE company hasn’t made many innovative changes to their product in the last few decades, which has allowed other companies like Kamado Joe to make headways into the market. However, when you have a product that is as popular as theirs, you already have a good thing going! 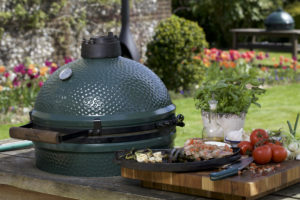 Learn more about this at BigGreenEgg.com – you’ll have to find a registered dealer in your area to buy one for yourself though – they aren’t available for purchase online at this point. If you like idea of a kamado grill but aren’t ready to make the investment in a full size cooker, take a look at this entry by Vision Grills. It is a more economical, smaller grill, a ceramic kamado that has good reviews across multiple sites. The materials are all high quality: it’s made from a heavy duty ceramic with a glossy charcoal grey finish (the picture looks a bit green, but it is charcoal), and stainless steel cooking grates. The size makes it portable – although ceramic is heavy and fragile, you can move this grill as desired without too much trouble. It even has metal feet so you can cook on a standard picnic table! You get the side shelves built onto the grill so there’s space for your grilling accessories near your food. It has a unique effortless “electric starter port”, so you don’t have to play with matches or a lighter to get the coals started. The heavy lid has a handy spring assist that helps you open it slowly and smoothly. The two chimney on the top and the draft door on the bottom both adjust easily so you can get the exact temperature that you want inside the grill. It’s really easy to assemble this grill, and it comes with all of the tools required to do so! Customers report that you can be cooking within 20 minutes if you want to, after the shipment has arrived! If you like to entertain or cook for a crowd, you’ll love this next grill, again by Kamado Joe. This time we’re looking at their BIG model, “Big Joe II Stand Alone”. It’s a huge, heavy beast of a kamado, with a reputation as being pretty fantastic, holding temperatures from 225°F – 750°F. The huge cooking area! Although 452 sq inches isn’t quite as much as a big gas grill offers, as far as kamado grills go, this is one of the biggest you can find, and it keeps the heat and moisture consistent throughout all of that space so you can perfectly cook a LOT of food at a time. It comes with Kamado Joe’s patented air lift hinge that makes lifting the heavy dome lid extremely easy, and with Kamado Joe’s patented “Divide & Conquer Flexible Cooking System” (the multi-level, half rack design that lets you cook different foods on different surfaces at different temperatures). These two features are HUGE selling points for Kamado Joe’s line because they are pretty great – and the BGE (KJ’s biggest competition) doesn’t have them. You also get the slide out ash drawer system that makes cleaning really easy, and the patented rust-proof, rain-proof, Kontrol Tower Top Vent that helps prolong the life of your grill and helps you get precise temperatures for the duration of your cooking time. The KJ Big Joe II comes with a handy Grill and Grate Gripper Tool, an Ash Tool, a built in over-sized thermometer, and a Firebox Divider so you won’t have to purchase them separately. If you’re interested in adding this grill to your outdoor cooking area, remember that it’s an incredibly heavy grill that will require some strong friends to help you lift into place. Buying online lets you get it delivered to your house, which saves you moving it more than necessary, but do think carefully about where you will be putting it as it’s over 360lbs – or consider purchasing the specially designed stand to go with it. This next entry is what you can consider the best low-budget or “entry level” option. The Akorn Jr is the 14″ diameter model, while the original Akorn is 20″ (314 sq. inches of cooking space – see review). While both the Akorn and the Akorn Jr. are very popular grills, I’ve chosen to reviewing the Jr. here as overall it seems to receive higher reviews by customers – fantastic value for their dollar. Because it’s made from steel and not ceramic, and due to it’s compact size, this grill is durable, lighter, and easier to transport than most other options. This makes it a kamado that you can enjoy in your backyard but also take along tail-gating, camping, or wherever you want to enjoy a great meal. Although it’s not a large cooking area, it’s built with high quality cast iron grates that’ll cook you and a few friends some fantastic food. Steel makes it a more affordable grill than ceramic – which you’ll very much appreciate if you’re on a budget. You still get a grill that holds and locks in heat very well (it’s triple wall, insulated steel), and with top and bottom air dampers that give you easy and precise control of temperatures, so you don’t have to be concerned that a non-ceramic kamado isn’t good stuff. It is. It will maintain temperatures from 200 – 700 degrees F, great for your low and slow smoking and your quick and hot searing jobs. Some smart additions Char-Griller added to the Akorn Jr.: an easy dump ash pan that saves you time cleaning out the coals, and a hinged locking lid that helps you reduce heat and smoke loss when you want to check on the progress of your meal. 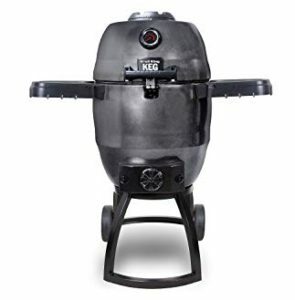 Overall, the Akorn Jr is a really good option for those who want to see if they love kamado grilling before committing to an expensive, larger model – or for those who simply want a smaller, portable, efficient kamado that has lots of high customer reviews and is consider great value for the price. Next we have another “steel body” entry – this one a big, impressive kamado grill that should get the attention of those of you who want to be able to have a great kamado for your backyard patio, but also one that is designed to be PORTABLE – and this one is. It comes with a wheeled base that is trailer hitch adaptable and the side shelves are easy to remove – it’s perfect for tailgating or bringing along for a great day out! The Keg has a pull out ash try that makes cleaning out your grill after a long cook easy to do, and Broil King’s Root Draft damper system that works to give you precise temperature and airflow. Being made of (oven-grade, double-wall, insulated) steel, you don’t have to worry about the grill cracking or being damaged during shipment. Steel also heats up somewhat quicker than ceramic, (and using less charcoal than a ceramic model), so if getting your grill to temperature quickly is important for you, the Keg is reported to be really quick that way. It comes with a handy multi-tool that’s designed specifically for the Keg – it’ll help you with safe maneuvering the grill grates and charcoal. The Broil King Keg isn’t a cheap kamado grill, but you don’t necessarily want a cheap grill if you plan to use it regularly and bring it on the road with you. It has tons of followers and fans on Youtube – here is a great “Keg Overview” video, but Youtube also has a ton of other videos to check out for recipes and tips on using yours! Next on the list is a grill that many people tend to have on their “favorites” list alongside the Kamado Joe Classic II and the BGE. The Primo Oval XL is a kamado grill that has a big group of fans on Youtube and one of the things that sets it apart from the others is that it’s the only kamado grill that is NOT a perfect egg shape. It’s made from premium ceramic, fully made in the USA from domestic materials. This grill has dual zone cooking, making it very versatile! The way it works is that it has reversible cooking grates, giving you the capability of cooking closer or farther from the coals. They are also split down the middle, meaning you can do one high and the other low… getting different temperature zones on the same grill, perfect for cooking different types of foods at the same time. It’s easy to assemble the stainless steel cart that comes with this particular option (includes 2 side shelves and a basket), and the grill is already put together fully! The only challenge is lifting the kamado into the cart… it’s EXTREMELY heavy! Once it’s in, you’re good to cook for years to come though! Primo is reported to have fantastic customer service and it backs it’s product with a limited Lifetime Warranty, a 20 year guarantee on all ceramic parts (which will make those of you worried about cracks breathe a bit easier), and 5 years on all metal parts (excluding cast-iron parts – 1 year). There are several optional add-ons available (such as a fire-box divider, and other racks and grates) if you want to change it up after using it for a while! Remember, Primo has a lot of fans to cater to! This kamado by Blaze is another innovative option on our list – it’s the only one that’s not made from ceramic or steel… it’s made from 1″ thick, premium cast aluminium! The more you learn about the details going into the making of this grill, the more impressed you get. 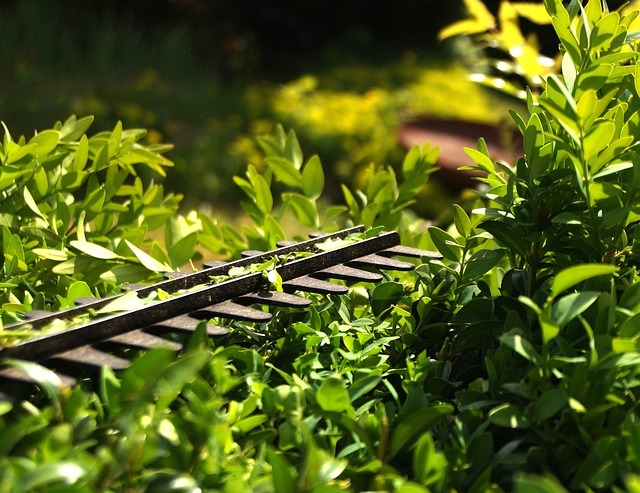 All of the hinges, grates, screws, everything… is high quality, heavy, and built to LAST! Reviewers say that it does a great job of maintaining heat levels, as well as adjusting quickly to whatever changes you wish to make. The aluminium is not going to rust or chip, so you’ll have a nice looking, solid grill for the rest of you life. Yes, your life. It comes with a lifetime warranty… how’s that for standing behind your product??? Because this is a higher end kamado grill, it’s going to cost a bit extra. 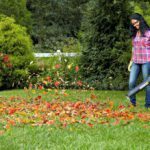 I think it’s worth the price they are asking, but if you’re looking for a budget-friendly model, this may not be the one for you – there are plenty of other more affordable options. But if you’re looking for an incredible addition to your outdoor cooking space, something that’ll be an eye-catching conversation piece AND an exceptional kamado, here you go. 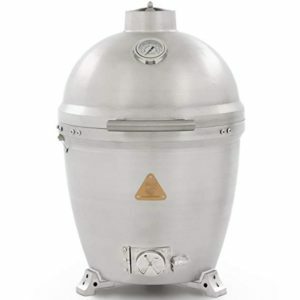 This next entry by Pit Boss is a good choice for those of you looking for a ceramic kamado with a larger grilling space but at a more economical price than a Big Green Egg or Kamado Joe Big Joe. It’s slightly lesser quality but unless you’re really into kamado grilling already, you will probably not notice it, to be honest. You get dual tier cooking, which doubles your usable space inside the grill. Both grates are made from stainless steel and you can use them both for cooking (not just one for cooking and one for warming like on many gas grills). Dual tier cooking also means you have a ton of versatility in how you cook different foods! It has a cast iron damper on the top that you can fully control letting you set the temperature inside exactly how you want it. It comes with two solid, fold-able bamboo side shelves that will give you lots of room for prep and serving, a handy ash tool for clean up (no sliding ash tray, unfortunately), as well as a sturdy nest and stand that will protect your investment from tipping and breaking. Although the heavy lid doesn’t have the fancy featherweight air hinge like the Kamado Joe, it does come with heavy duty hardware, a wood handle, and springs that help you lift it and hold it in position. Pit Boss added a (fire proof) felt edge and a shock absorber that will protect the ceramic body from cracking in the event that you drop the lid drown with too much force. 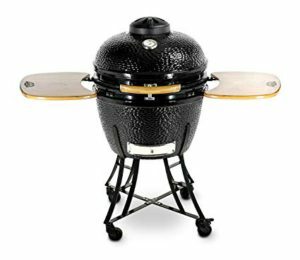 The Pit Boss Kamado 24″ is a great choice if you are able to pass up on the fancier add-ons designed by Kamado Joe and just focus on the grill itself. It’s reported to do a good job at temperature control, has lots of space, and comes in at a pretty decent price for what you get. We’ve already seen the Akorn Jr. Kamado grill above; here we’re looking the full size model by Char-Griller, “the Akorn”. It’s very similar, no surprise, to the Akorn Jr., so many of the details are the same. It’s a steel body kamado with good reviews, overall. You can select the color of your grill; the exterior of the triple-walled, insulated 22 gauge steel body is powder-coated either blue, red, or black. You’ll appreciate some of the small details on this grill, such as numbering around the damper so you can note the positioning of it during your cooks. There’s a wheeled cart included (with locking rear casters) so it IS considered a portable grill (although not as easy to move around as the Akorn Jr. – the Jr. is significantly lighter). It also comes with a locking lid, 2 black metal side shelves with handy utensil hooks that fold in, and an “easy dump” ash pan – all things you won’t need to add on later. You’ll love the versatility of this cooker – you can sear at high heat or roast/smoke meats low and slow – the Akorn can hold temperatures for you from 200-700 degrees F.
The next entry is a very budget-friendly kamado grill that is designed a bit different from the others as far as the air intake is concerned: the air flow does not come from the bottom through the top via two dampers, but instead there is only one opening at the top. 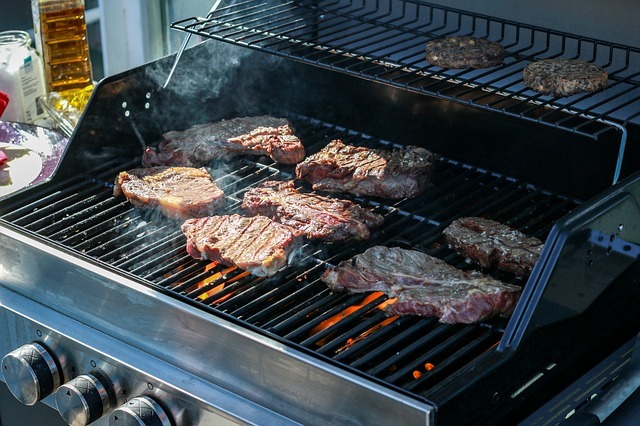 Char-Broil asserts that having the air circulate around the grill from only the top makes it easier for you to control the temperature inside; you have only 1 control to adjust, and you don’t have air leaks happening below by the coals. (The ash pan and drip pan are even carefully designed to be removed from above, so they really have thought the details through!) There are lots of positive reviews on it, so perhaps their innovation has paid off. The body is made from insulated double-wall steel that traps and seals in the heat and moisture that makes your food taste so great after cooking. You can use it as a smoker, roaster, or grill; it’s extremely versatile like the other kamados we’ve seen. It comes with a large folding side shelf (complete with handy utility hooks) that works as your prep and serving space, and it also comes with a sturdy wheeled stand (yes, it’s portable) that has a wire shelf on it where you can store your extra charcoal or grilling gear. It has porcelain-enameled cooking grates on the primary surface, and the secondary cooking surface is made from chrome-plated steel, and you can adjust the height or swing it in or out depending on your needs. This is a pretty inexpensive way to get a kamado style grill for your backyard. It isn’t made of as top quality materials as some of the other steel kamados above, but it’s still very sturdy and well built. For what you pay, you can definitely consider yourself getting a lot of bang for your buck, in other words. And something that’ll create some impressive food. Enjoy Your Kamado Grill This Year! There’s something so incredibly satisfying about serving your family and friends a perfectly cooked meal. And nothing says perfectly cooked like sweet and tender meat the just falls right off the bone, full of delicious smokey flavor. 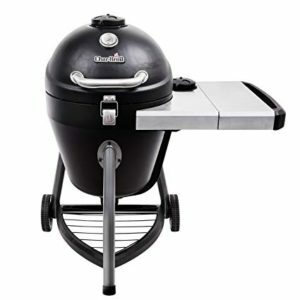 A great kamado grill such as one of these best kamado grills of 2019 can get you that. Hopefully this post has been helpful in directing you towards the best kamado grill for your particular needs. 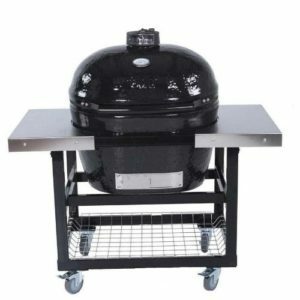 We’ve looked at a big variety of grills, made from different materials and of various sizes, some with stands, others stand-alone, and in a range of prices. It’s my hope that you found what you need. Let me know if you have any questions, feedback, or comments – I’m always happy to hear from readers and will get back to you quickly! 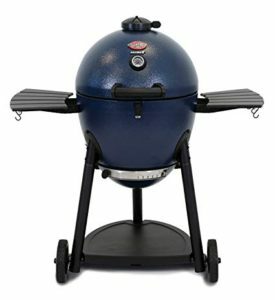 Want to do some further learning about kamado grills? Keep reading! Check out this video here by “Mark In The Pit” showing some awesome maintenance tips, as well as what he calls tips and hacks for your kamado grill. You’ll very likely learn something new! Although many people now are just sort of discovering kamado grilling, it has actually been around for centuries – even millenia depending on which histories you read. Just not in North America. There is proof that the ceramic cooker existed in Japan already in the Edo period (approx 1603-1868) for sure. The idea of a ceramic cooker was possibly brought to Japan from China long before that though, where a similar model was used. Under the Japanese, the cooker – known as “mushikamado” at this point – slowly evolved. They added a removable lid, a damper and draft door, and changed the fuel from wood to charcoal. Another big change was moving from clay pots to ceramic, a better heat insulator. The story goes that when American soldiers were stationed in Japan in the 1960s, they discovered this fantastic cooking method, and brought the idea back home with them. In 1974, Ed Fisher took the Japanese idea, and refined and tweaked it into what you know now as “the Big Green Egg” – and what became known as “kamado grilling” took the (grilling) world by storm. 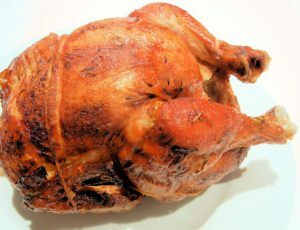 The Rotisserie Question: Is One Needed? The answer is no. Here’s why: The reason someone would use a rotisserie in the first place is to allow meat to self-base and not dry out during a cook. If you are cooking meat inside a kamado, it already stays moist due to the entrapment of heat and moisture inside the closed grill. Kamado cooking doesn’t need basting at all. And so, no rotisserie needed. That’s all for now, folks. I hope you enjoy your kamado grilling experience to the max! As always, drop me a question or comment and I’ll get back to you asap.